however this is just mouth-to-mouth info, I've never actually heard it. There's a Sealed Copy of Rarities available on eBay -> http://cgi.ebay.com/ws/eBayISAPI.dll...m=260717377933. Management/record company wanted the New York shots and Polly and Maria Mochnacz "quickly regretted it." Interesting! I have that picture from a magazine cover. I'm so glad that wasn't the album cover. It doesn't fit with the tone of the album at all, and isn't a particularly interesting photo either. The real cover photo is a classic. i never knew until i heard the interview clips on PJ's iTunes Originals set about working with Thom Yorke that he also did background vocals on One Line and Beautiful Feeling. ^The 2007 version of Big Exit is incredible. It brings out all the drama and danger in the song that was glossed over in the Stories version. It's like what I think Big Exit would sound like if it had been written for TBYML. I always thought the same thing. Her vocals on the verses are so much more evocative and frantic. I assume it was how the song was originally written (according to the chronological BMI list a good majority of the songs that made it on to Stories were written while Polly was still penning tracks for Is This Desire?) and hints at possibly less straightforward versions of the songs on Stories. yep... for the longest time, I thought that haunting sound on OneLine was a cello or oboe. Nup, it's Thom on bvs. stellar. The whole thing, for those of you interested. Thanks! I've wanted to see this for quite some time, surprised they finally put it online. I remember reading several times that Polly's management threatened legal action if it was ever made available to the public. Perhaps they found a loophole? Either way, going to watch now before it gets taken down. I've been waiting and wanting to watch this for a while as well, so thanks for sharing it. Just watched "Stories from the Road" and loved it. It left me feeling giddy. 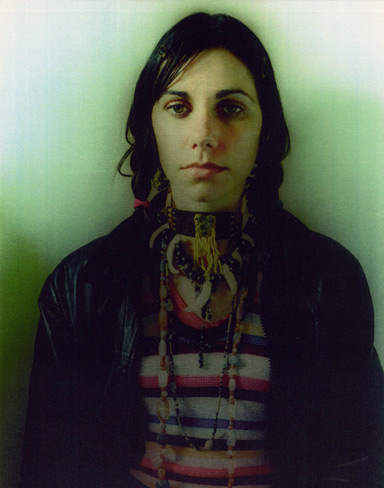 I can't wait to see PJ Harvey again!